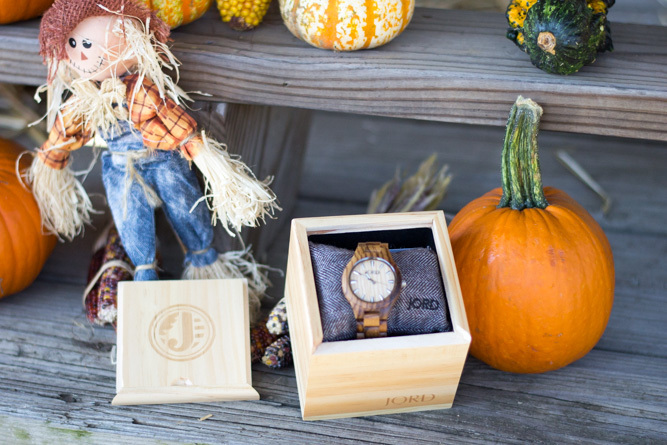 If you read my post last week, you saw that JORD and I are working together to giveaway one of my readers a change to win a $75 e-gift code to put towards your very own JORD wood watch! Everyone who enters will receive a $20 e-gift code just for entering, so what is there to lose?! This is the watch that I have, but JORD has a great selection of men and woman watches! You have until this Sunday to enter! ENTER GIVEAWAY HERE! I can't explain how excited I am that bootie season is finally here!! I seriously will where booties with any outfit that I throw together. There are just so many different ways to wear booties and I love to try and find new ways to style them. What is your favorite way to style your booties this fall? I can't believe Halloween is already upon us! But it makes me so happy because that means there are Halloween movies all over tv! What is your favorite? I can't wait to watch Hocus Pocus and The Nightmare Before Christmas! Are y'all dressing up? What are you being? I'm being a unicorn haha! I don't think we have plans to do anything for Halloween, but I'm excited to lay on my couch in my unicorn onesie! Ya'll are probably getting tired of hearing about it, but I have something super exciting (well I think it is exciting anyway) going on this weekend! I am going to be spilling the beans in my October Newsletter that is going out this Sunday! Make sure to subscribe to my newsletter if you want to find out what is going on this weekend! You can subscribe HERE! October happens to be also one of my favorite months. It is my birthday month. And just like you I love the bootie and ugh season! Btw great watch! I can't believe how fast October went and the holiday season is starting! Love this roundup, I'm so with you on bootie season...yay for all of them! JORD always has such beautiful watches, love the one you picked out! I hope you have a great weekend! Perfect faves!! The Jord watch looks amazing! I'm looking forward to watching Hocus Pocus this weeeknd! Hocus Pocus is on my DVR to watch tonight! We are heading to a party this weekend and have no costumes so I'll be scrambling :) Love that watch! I love how fall it's feeling these days and I'm definitely ready to break out my UGGs and spend some time in the crisp weather this weekend! Those UGG boots were my favorite of the month! Can't wait to see what you're sharing! Jord watches are so chic! Love the one you picked out! Fall is seriously the best!! Jord watches are so fun! Love the one you picked! Those watches are beautiful, my favorite is the frank series collection. I didn't know UGGs looked like that either. I seriously can't believe that October is already gone... Love those UGGs! I actually love UGGs...they're so cozy! Love those watches! Great post!